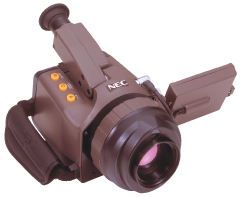 Thermo Tracer TH9100MLN/WLN | Infrared Thermography | NIPPON AVIONICS CO.,LTD. New Feature Visual and Thermal Image Composite Included! minimal parallax and the same magnification with the infrared lens. Simultaneous storage of infrared and visual image in the same file. Standard lens has high resolution I.F.O.V 1.2mrad. Measures visual image and infrared image simultaneously and displays the composite image which is easy to identify abnormal thermal spots. indoor.Fully functional in bright light. Detachable and extendable with optional extension cable. Remote controller available as option. Approx. 2 and half hours operation available with a small and lightweight battery(appox. 100g). Battery life indicator tells you the timing to change the battery.